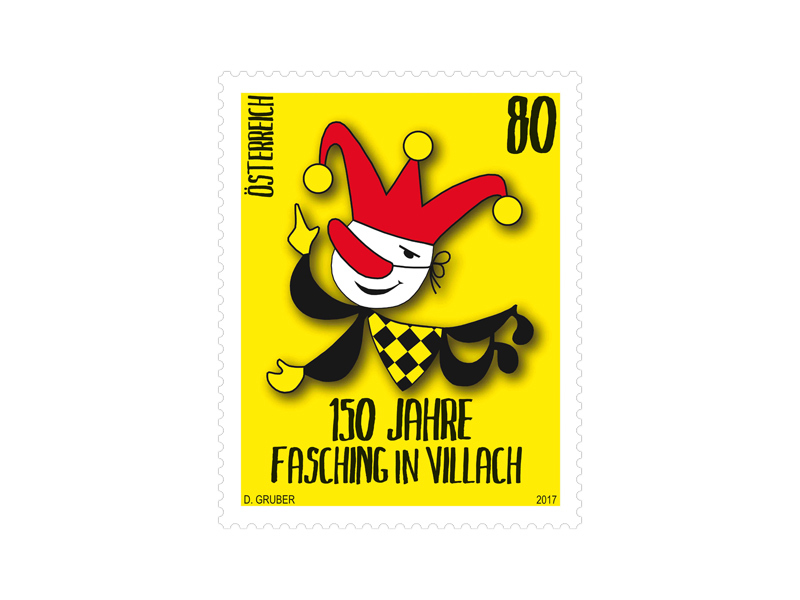 On Shrove Tuesday 1867 a successful parade involving hundreds of costumed participants came to an end in the Carinthian city of Villach, and with it the famous Villach Carnival was born. 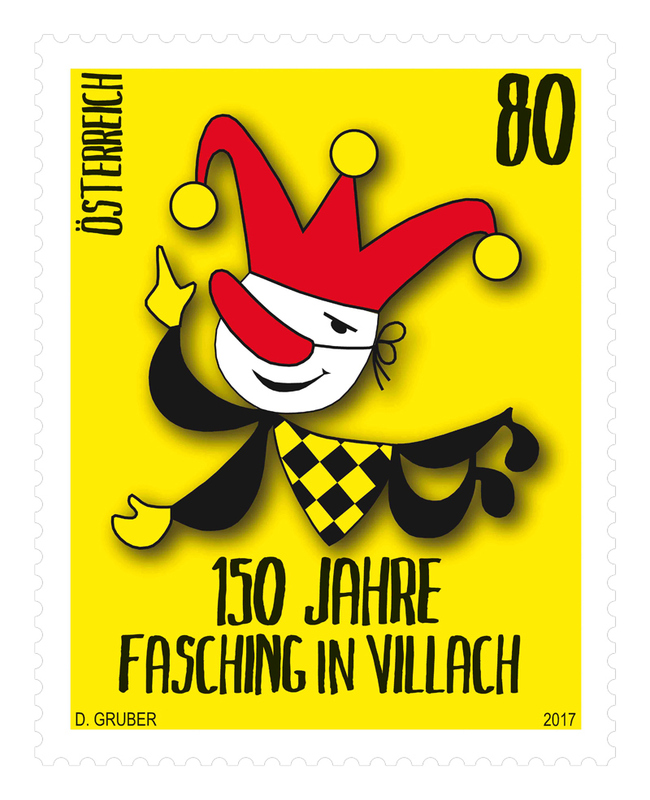 Austrian Post is celebrating the 150th anniversary with a Lei-Lei (the traditional carnival greeting) and a commemorative stamp showing the emblem of the Villach Carnival Guild: a little jester in a jester's hat. At the start of the 20th century it was the Bauerngman Villach which organised the Villach Farmers? Ball as a carnival event. The Bauerngman is still active as a charitable organisation in Villach and organises Villach?s Kirchtag and other charitable events. In 1955 the Farmers? Ball finally became Villach Carnival and, as enthusiasm for carnival continued to increase among the local populace and the first carnival shows were staged, the organisation was taken out of the hands of the Bauerngman and a special association was founded specifically for the purpose. 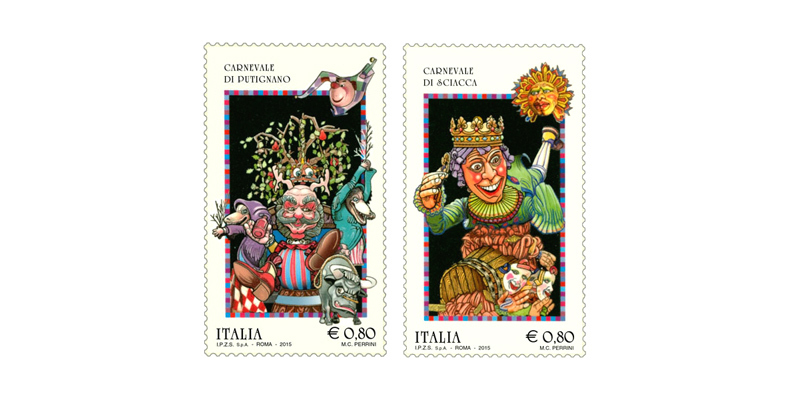 This association, the Villach Carnival Guild, nowadays comprises over 200 active members, who work throughout the year on a voluntary basis to organise the carnival events. Texts are written, roles learned, choreography rehearsed and practised again and again, until the carnival shows are put on in front of an audience during the carnival period. Year after year, up to 16,000 spectators enjoy a live show. To this is added a television audience of thousands, who watch a two-hour compilation of the Villach Carnival show programme every year on Shrove Tuesday - a perennial evergreen which always attracts high viewing figures. What is more, the carnival shows - or excerpts from them - have been broadcast on Austrian television since 1963, making Villach Carnival one of the oldest television programmes in the country. The highlight of the carnival season is the grand parade on Carnival Saturday, in which around 150 carnival groups comprising over 3,000 jesters in fancy dress take part. The best costumes are judged and rewarded in different categories by a jury. On this day, the whole of Villach is involved in the festivities; everywhere you look there are people in costumes, and thousands of visitors come to watch the spectacle. Like the parade, the carnival shows are a fixed point in the carnival season. Legendary protagonists such as the Apothecary - now retired - Noste or the EU farmer comment on the current political situation, the guard dances and the court orchestra performs. Every year a carnival prince and princess and a children?s carnival prince and princess are chosen, and for the last 50 years there have also been special carnival shows for the children.